George Clutesi was a teacher of Tseshaht values, beliefs, traditions and culture. He was born in 1905 in the Tseshaht village of maaktii to Katherine and Charlie Clutesi. His mother died when George was 4 years old and he was raised by his father and aunts in his mother’s home village of Hupachasaht. They encouraged the young boy’s gift of artistic talent. He was born in a time when the old ways of the “Indian” were being pushed aside for mamaxnii ways. The Tseshaht people were highly adaptable and embraced positive change. Some of the changes however, were negative and forced on the Tseshaht. It was a difficult transition. George remembered being forced to go to the Alberni Indian Residential School. He remembered his father, through tears, throwing rocks at him and telling him he “had to” go to school. There was a “total alienation of parental love for the small child” within this school. There it was hammered into the heads of these children that “they must forget their home, their life, their teachings, their family, and, especially, their nationality.” Within this cold atmosphere, George escaped into his art. George married Margaret Lauder and raised 6 children and numerous “foster” children. As a young father he gained employment as a fisherman to support his family. In 1947 George began to contribute essays to the Native Voice, an aboriginal newspaper. At the time, employed as a pile driver he broke his back. While receiving treatments in Vancouver he met Ira Dilworth, the Chief Executive of the Canadian Broadcasting Corporation in Vancouver. Dilworth encouraged George to reshape his stories for the airwaves. George began broadcasting Tseshaht stories to people across British Columbia. By 1949 George had written his play, They were a Happy Singing People, a play which spoke of First Nations pride, song, and dance. Also in 1949 George hitchhiked to Victoria to see the Right Honorable Vincent Massey, Chairman of the Royal Commission on the National Development of the Arts, Letters, and Sciences to ask his permission to practice traditional song and dance, which had been criminalized by Canadian legislation. Vincent Massey told George to go home and sing. George, a janitor at the Alberni Indian Residential School began to teach Tseshaht song and dance to the students. He then taught Tseshaht children and youth their songs and dance. This was not always easy in a time when our traditions were being promoted as “primitive” and undesirable. But, George persisted and eventually the songs and dances became more acceptable and requested. Others within neighboring communities began to do the same. A revival had begun. Publisher Gray Campbell of Sidney sought George out to request that he gather some stories for publication for a Centennial Project. George published and illustrated a set of 12 Tseshaht teaching stories under the title of Son of Raven, Son of Deer in 1967. He became one of the first native people to write about First Nations legends and customs, formerly the realm of anthropologists and folklorists. 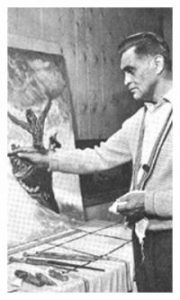 George was also hired to paint a huge mural on the wall of the Canadian “Indian Pavilion” at Expo 67. George published two more books, Potlatch in 1969 and Stand Tall My Son posthumously, as per his request, in 1990. George added actor to his resume when he performed in Dreamspeaker in 1977, Nightwing and Prophecy in 1979, and The Legend of Walks Far Woman in 1982. He also starred in the 1973 made for television movie I Heard the Owl Call My Name which was set in the Nuu-chah-nulth village of Ahousaht. George also made guest appearances on many television serials. George was an ambassador for all First Nations people. He was highly visible and respected both within his community and throughout Canada. In 1971 George received an Honorary Doctorate in Law from the University of Victoria in recognition for his contributions as a Nootka writer and artist. On June 19, 1973 he received the Order of Canada, Member, for his contribution to the preservation of the culture of Indian peoples and for his contribution to painting and art in Canada. In 1977 he received an ACTRA award for his performance in Dreamspeaker.